Side hinged garage doors. Old style - modern performance. 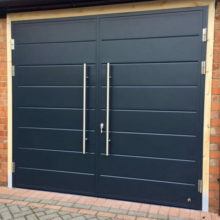 With no tracks, rollers, cables or mechanisms, side hinged garage doors are simple solid leafs connected to the frame via hinges. However, our modern take on this old style of garage door may be not as simple as they appear at first glance. 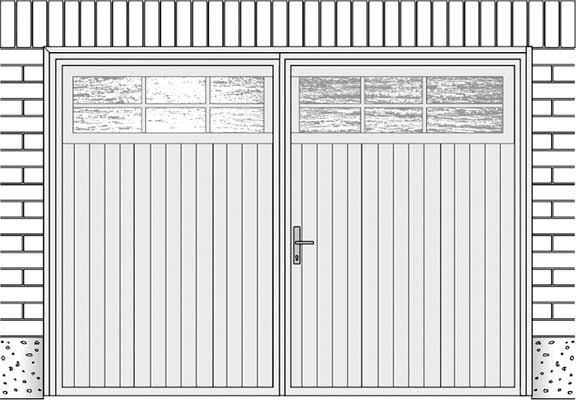 Ryterna side hinged garage doors combine traditional appearance and modern design. For technical details please scroll down. 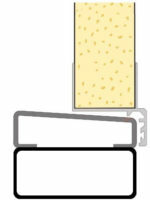 To eliminate draughts and keep the elements out our ‘P’ section side hinged door frames are rebated to fit the leaves. 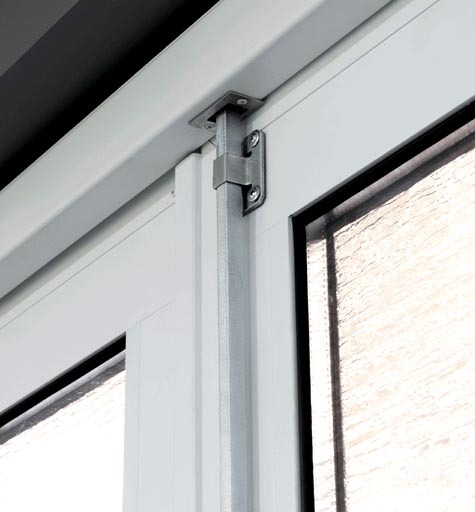 We construct it from 2 mm thick steel with mitred corners and welded reinforcement for strength. Furthermore we zinc coat, prime and powder coat frame steel for extra durability. Frame with mouldings could be a good choice if door is fitted flush with front wall. Moreover for custom installations we manufacture side hinged garage doors with tubular frames. 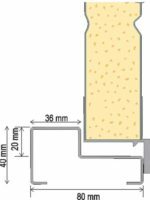 As standard we use 40×60 mm rectangular tube but othe options are awailable as well. 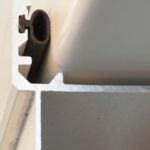 We connect leaves to the frames using high quality aluminium alloy hinges. 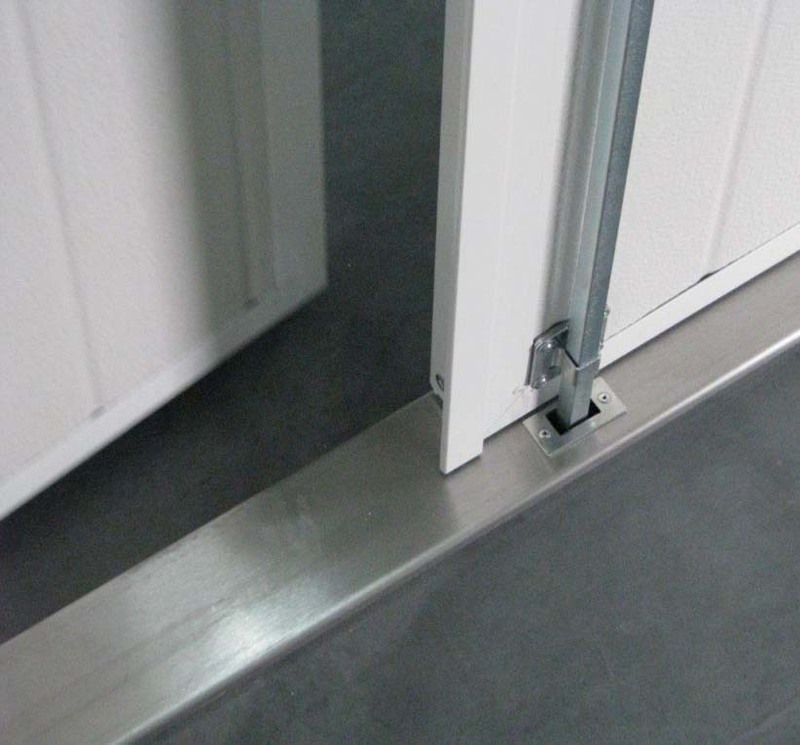 Each hinge we equip with a roller bearings for a smooth opening and closing action. 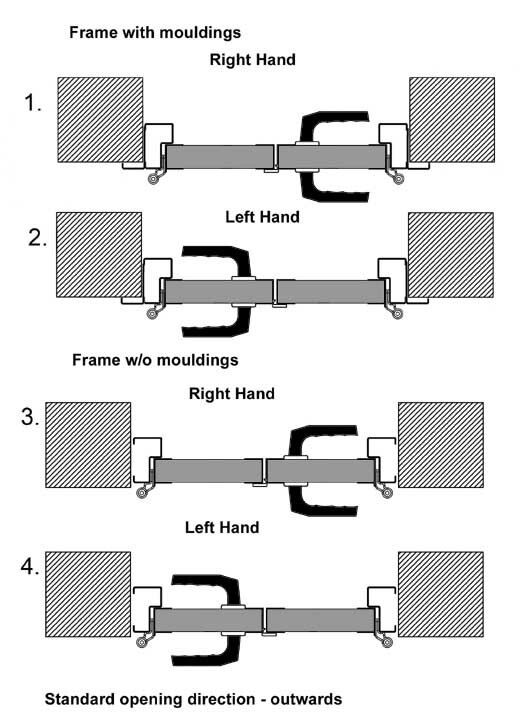 In addition hinges are adjustable in two directions. 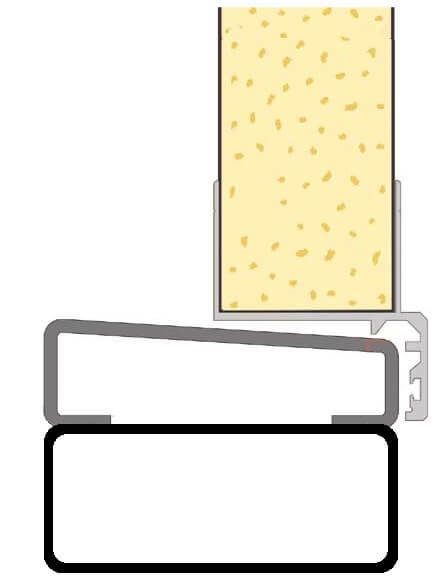 This feature means that your door will always keep perfect shape despite how intensively it will be exploited. Even more new design hinges significantly speed up installation process. 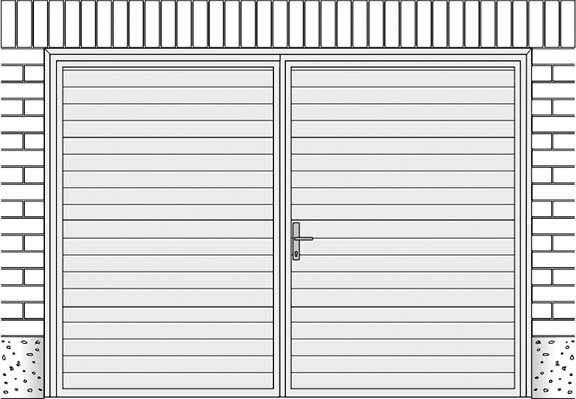 Side hinged garage doors seems like a good choice if you use garage as either office space, a workshop or simply for storage. 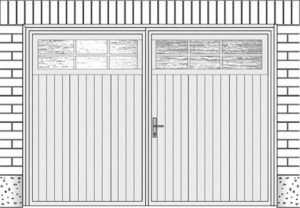 We can design side hinged garage doors to replicate existing traditional looking doors. This is especially important for conservation areas where new door must maintain old garage door design. 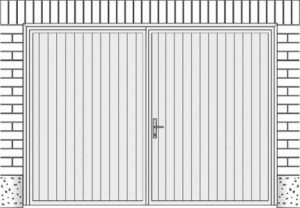 Ryterna manufacture bespoke side hinged garage doors for your opening. Maximum opening sizes of 10 feet wide and 10 feet high. 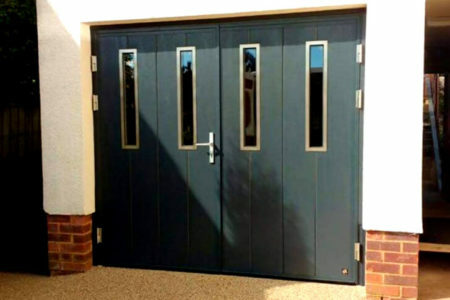 However we can make larger size doors – please contact us for feasibility. As a standard we manufacture doors with 50/50 or custom split. 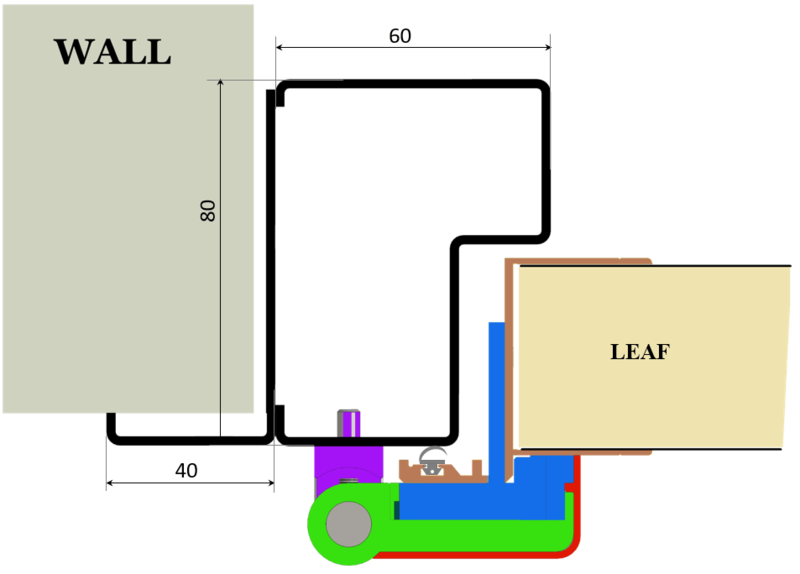 For door leafs’ exceeding 1.5 metre wide consult for feasibility. Ryterna side hinged doors can be made with either left or right hand first leaf opening first, and opening outwards as standard. Yet inwards opening leaves can be specified. Bi-folding leaves is perfect solution for garages with short or upward sloping driveways or door opening inside as well. 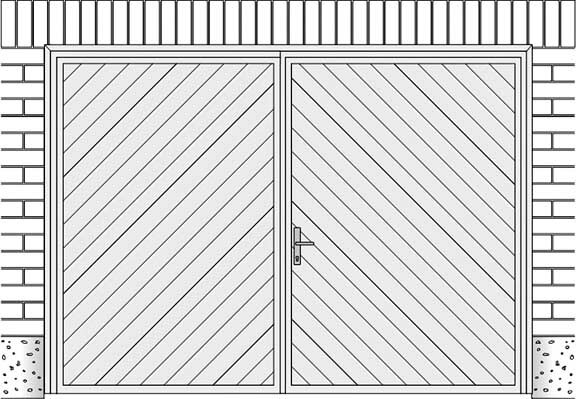 Ryterna can make side hinged garage doors in several different layouts. Furthermore custom or combined layouts available. We offer 14 sections’ designs and can paint them any RAL or BS colour. Hence wide horizons for your creativity are open. Furthermore – smooth surface panels we can paint with metallic or structure finish and gloss up to 90%. Combining different colour or design sections and stainless steel windows on one door can create stunning door look. Six wood image sections can match almost any architectural setting. Door frames and leaves are painted same colour as standard but you can specify different e.g. door leaves in red and frame in white colours. In addition we can also paint handle and hinges custom colour. Also glazed panels is perfect option for workshops and offices. Save on electricity bills by letting sunlight in. Also as an upgrade to our standard single point latching and deadbolt style lock, you can choose to add 3 point locking. From a simple turn of the key you can activate lock with a single latch and 3 deadbolts. 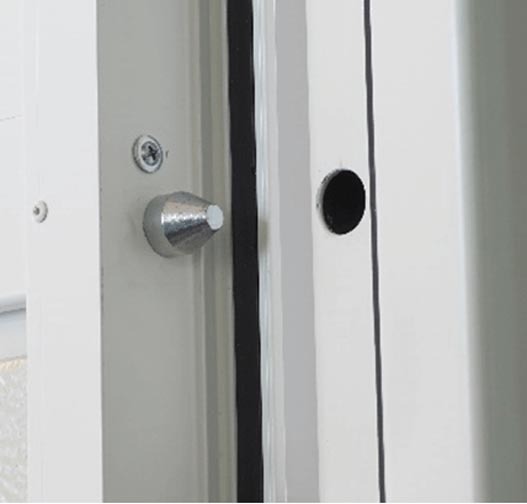 Standard lever handle sets are available in white, black or aluminium at no extra charge. Any RAL colour as an optional extra. 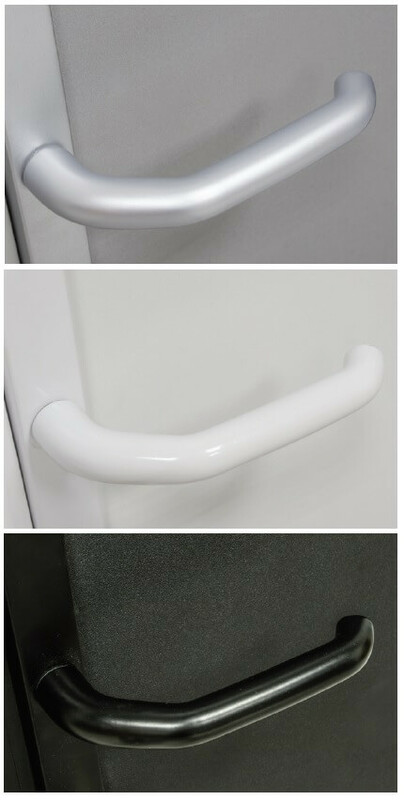 We also offer a range of different style and length of stainless steel tubular pull handles. 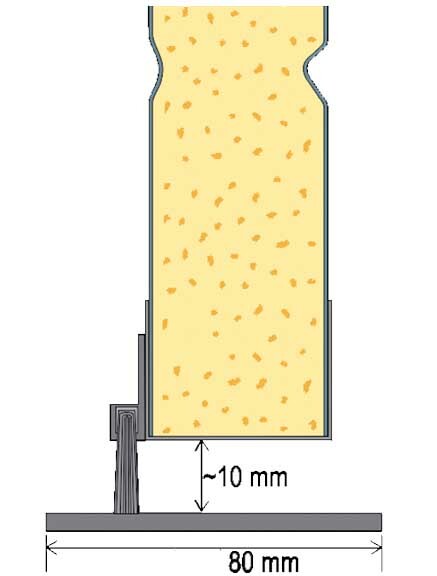 And the range is from knob up to a maximum length of 1800 mm. 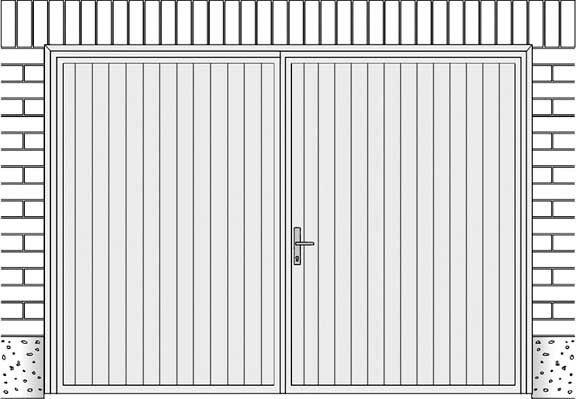 We supply side hinged garage doors with a pair of original door stays with adjustable opening angle. Therefore you can adjust door opening angle between 90° and 140° which is important in narrow or cornering driveways. 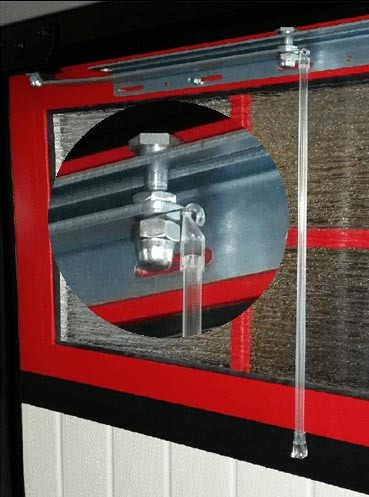 Door stays keep leafs in open position and prevent doors from colliding with the walls or car. 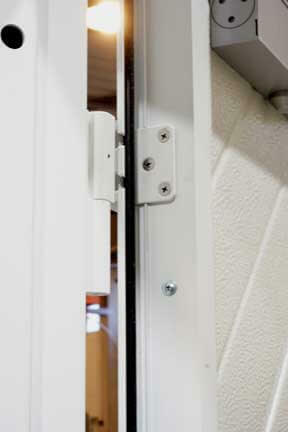 For taller doors, stay rods help to dis-engage the door stay and make closing the doors easy for all. 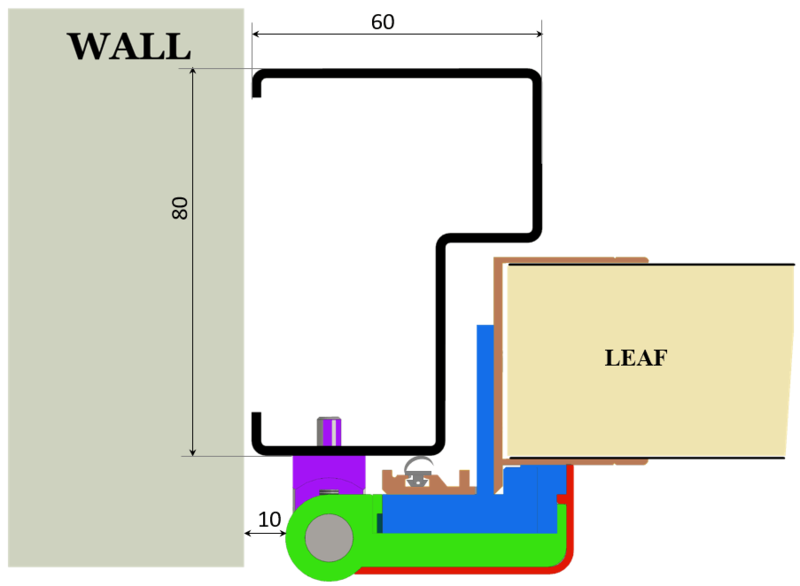 You can upgrade second leaves locking from standard flush bolts to ‘espagnolette’ lock. As a result user can simply and easy operate the high security solid locking bars from one high quality conveniently situated lever handle. All side hinged garage doors we manufacture are with hinge-bolts as standard. 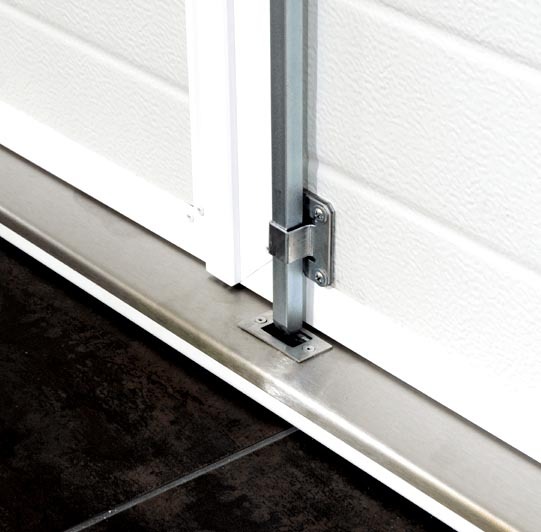 No doubt – hinge-bolts increase security and prevent of unwanted lifting or levering of door leafs in an attempted break-in. In addition Ryterna offer 3 threshold options for side hinged garage doors. 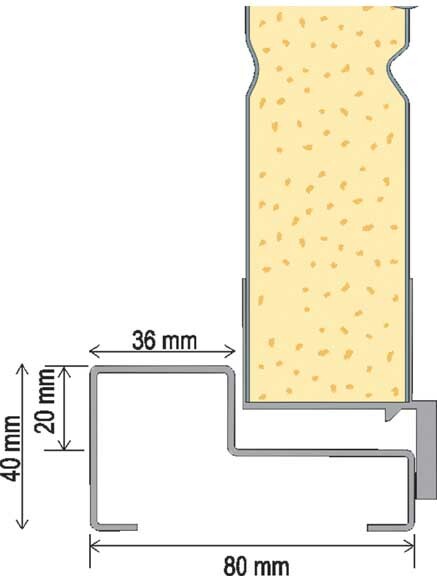 ‘Sloping’ threshold – standard and universal option. if you use garage for a car – this option is for you. 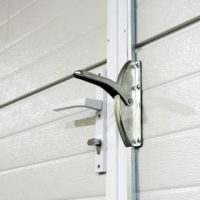 Brushed stainless steel covers are also optional and help to protect paint and to give more luxury to your garage door. 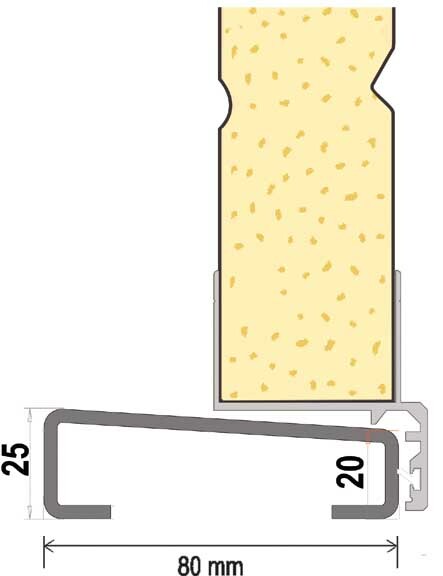 ‘L’ shaped – a rebated threshold similar to the side frames. Good choice if you use garage space is used as utility room, workshop, etc. ‘Flat’ – this 80 mm wide x 5 mm thick flat steel. 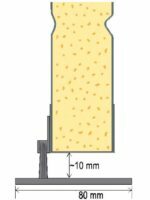 Flat threshold is mainly used where drive-through must be even. Especially where disabled access is required, Caution – the potential for water ingress is likely. 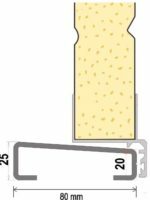 For slightly upward sloping driveways we can manufacture raised thresholds. Due to raised threshold you can eliminate the leaf clashing with the driveway or water coming in to garage. 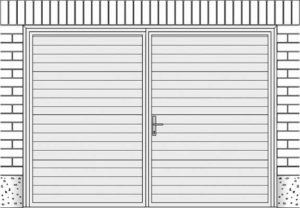 Side hinged garage doors are designed and made for manual operation. 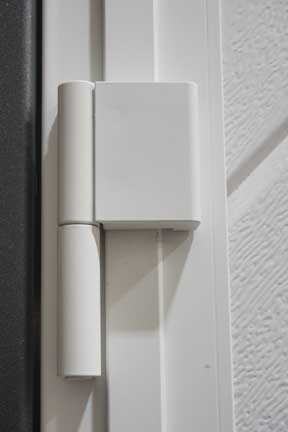 But some customers despite our recommendations want to install electric door opener with remote control. We can supply ‘ready for automation’ side hinged doors. Due to doors are designed for manual operation we install additional reinforcement plates to connect a hinged door conversion kit rods. CAUTION! Do not remotely open or close side hinged door without seeing it. Visit our PHOTO GALLERY to see all design possibilities.